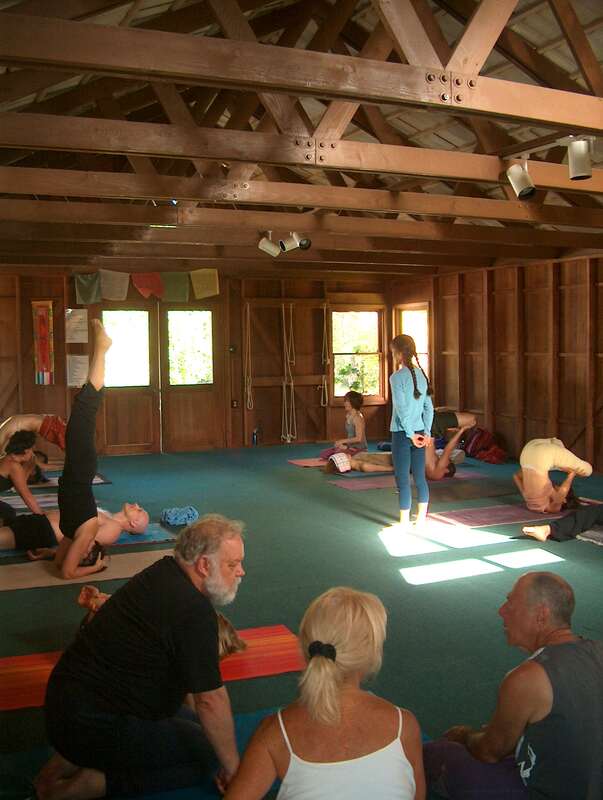 Snuggled in a tomato farm on a twisting Maui road lies a yoga shala. 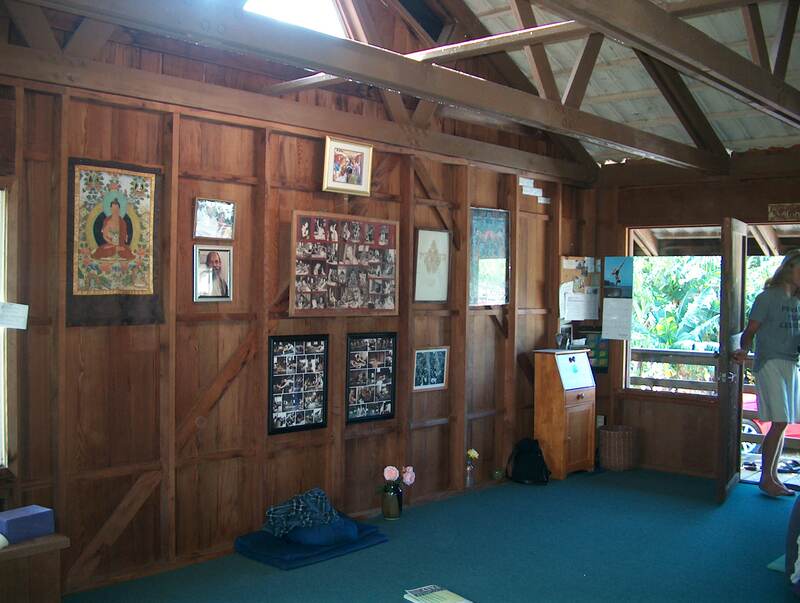 Completely unassuming and rugged, this little building holds one of the biggest hearts in Ashtanga yoga- Nancy Gilgoff. The shala is like Nancy herself- natural, simple and real. I am an Anusara teacher and I mostly align myself with that method but with children and husband’s needs it was just easier to study ashtanga with my husband, Chris, than it was to try to juggle two styles and two studios and two parts of the island. I had a major break with the Ashtanga system a few years ago and I am very wary of who I study with. I had met Nancy on a previous trip so I had a sense of who she was as a teacher and I felt I could trust her. Nancy Gilgoff is thought to be the first American woman to travel to India to study Ashtanga yoga with Pattabhi Jois. Certainly she’s one of a trio- including Doug Swenson and David Williams- credited with bringing Ashtanga to America in the 1970s. She has dedicated herself to teaching the tradition for close to 30 years- having only stopped teaching for a few years to raise her daughter. Day one with Nancy was brutal as her and her assistant Casie kept on us about our “Iyengar” habits. By day two, I had sorted out what she did not want me to do and like a good student I followed. My hamstring was still acting up so she asked me to bend my knee in the standing poses…except for prasaritta. She got me to really work the quads and come very forward into my feet… and my head was to be on the floor. She also asked me not to roll my thighs out for seated- she said it could aggravate sciatica and the hamstring. Rather than argue about methods or secretly do my own thing, I honoured the teacher and her experience in this method and did exactly as I was told for the whole two weeks. I figured my hamstring couldn’t be much worse and maybe it would help so I would do and observe. Maybe I would learn something. Nancy’s focus on the ashtanga practice was not one of perfecting the postures. Unlike other teachers I studied with, I was not constantly stopped at Marichyasana D because I could not bind. To her the practice is of breath and bandhas- it is an energy practice. You move and you move fast- there is a definite rhythm that underlies the pace of the practice. You do not fiddle or fight to get into a posture- one shot- five breaths and you are out- whether or not you bind that day is of no matter. Maintain the breath, maintain the bhandas and keep moving. I noticed that Nancy would often time herself to be right in front of a student at that key moment of going into a bind and just move them there with little effort and maintaining the rhythm. After a few days of practice she knew exactly which poses you could do and which ones you were struggling with. I have to say that Nancy and her assistants Casie and Keiko were amazing- I never once felt in pain or that I was being pushed beyond my boundaries- which unfortunately has happened to me in the past. A bad adjustment in ashtanga can create a deep seated fear in the posture for years- I know first hand. I literally cringe when a teacher walks up to me in prasaritta C. I noticed that none of them adjusted me in that posture. They obviously realized that my shoulders are just not open enough for my hands to touch the floor…. There was a lightness and a continual flow to the practice at Nancy’s that made it seem so connected. It was more physically centered than heart centered but I could see a connection to something bigger. The idea of just being happy with where you are at that day- not grasping and fighting yourself. Which- I have to say- is how I have often found my ashtanga practice. I looked around the shala every morning to see practitioners of all ages and abilities: Big, small, short, tall- primary series, second series and third series. What was noticeably absent was egos. No judging , no competition- just people all getting together to share their practice with this incredibly open and accessible teacher. 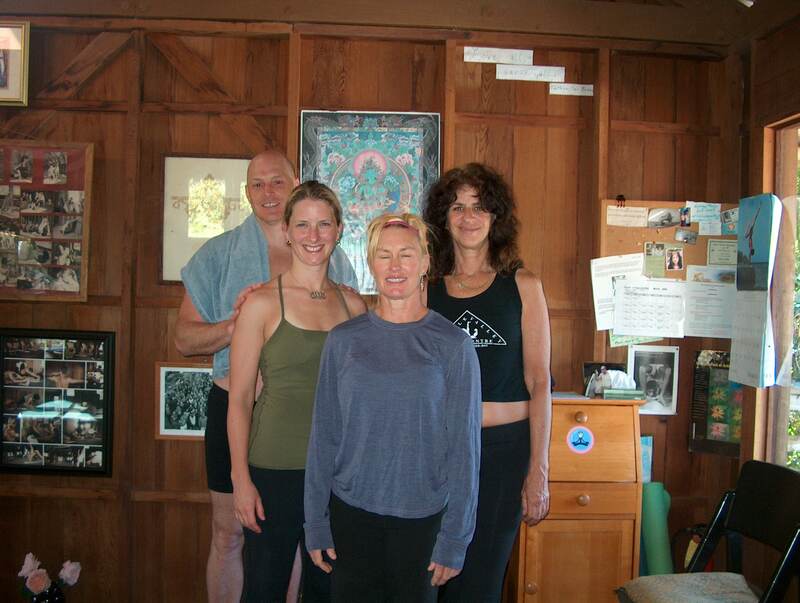 Nancy believes that EVERYONE regardless of age or size can practice ashtanga. The last day on Maui I told Nancy why I had stopped practicing Ashtanga- I was told I was basically too fat- and that is why I could not bind in Marichyasana D. Nancy was astounded. First she asked if I hit him…which made me laugh. She said that this was becoming a problem with Ashtanga- teachers with too big egos and too little heart. I could see the disappointment on her face. I could never imagine Nancy ever telling a student something like that. Chris and I had a discussion about Mysore when we left and we wondered why would we go there other than to say we had been there. The classes are so large in Mysore that you are never adjusted and if you are first series you are basically learning from those around you. If one wanted to truly learn and grow under the guidance of a teacher- then practicing with Nancy was a much better experience. I have to say that in many ways Nancy helped me to rekindle my past love of Ashtanga- maybe if she had been my teacher all along I would have never left the method. For all of you interested in a yoga vacation, I highly recommend Maui. The island itself just seems to be conducive to yoga. Early morning practice followed by salt water and sun makes for a very happy body. If you are looking for accommodation to study with Nancy family check out our friend’s cottages- Haiku Makai. They have a great fruit orchard that you can pick from and lots of Aloha spirit. A factual and honest account of what you can expect when you practice w/Nancy. Hey, I found your article soo interesting and so pertinent as today I am in Mysore practicing at the Shala with Sharath. He was helping me bind in Marichyasana D…then he uttered the words ‘no more chapattis, only fruit. One small meal a day only fruit.’ I was dumbfounded and angry and hurt all at once! How could he be so irresponsible to say that! I am not fat! I don’t eat chapattis! I’m a healthy size Uk 10-12 and I also happen to have quite large breasts! In that moment I thought to myself ‘if there was one reason to turn my back on Ashtanga yoga forever, YOU just gave me it Sharath. Nobody will admit to it, but there is a real nasty undercurrent of thought that says you must look a certain way to be able to succeed at this practice. I never thought this would be the place I would hear those words. I have 4 more weeks left at the Shala and I’m seriously doubting what it’s all for if this is the attitude. I though yoga was not all about the external asana and was an internal practice – a meditative practice. I guess I have been very naive. Thanks for letting me read your experience of this.